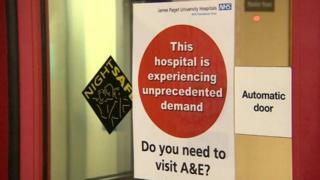 A £2.6m cash injection has been pledged to lift pressure on the NHS over the winter and to cut hospital admissions. Five clinical commissioning groups in Great Yarmouth & Waveney and the rest of Norfolk are providing funds . A key move is to extend the early intervention vehicle (EIV) - an ambulance to assess people who fall at home to see if they need hospital care. A six-month trial on the EIV last winter helped bring admissions down from 78% of emergency calls to 23%. From October, the service will run seven days a week all year round, instead of the four days a week seen last winter. Cath Byford, from the Norfolk and Waveney Sustainability and Transformation Partnership, said: "This is about what's out there in terms of best practice around the country and also what we have learned from last winter. "I believe it will have a great impact on our vulnerable people who don't need hospital but need help." A report prepared for the Suffolk Health and Wellbeing Board said the biggest challenge last winter was the large number of people going to hospital. To combat that, long-term care assessments will take place at home instead of in hospital. Two care co-ordinators will also be employed to help discharge patients from hospital earlier to prevent bed blocking. The number of community beds are to be increased. Decisions on winter projects in the rest of Suffolk will take place next week, but people are urged to support their NHS during the busy winter time by having 'flu vaccinations that could help avoid an unnecessary hospital admission.